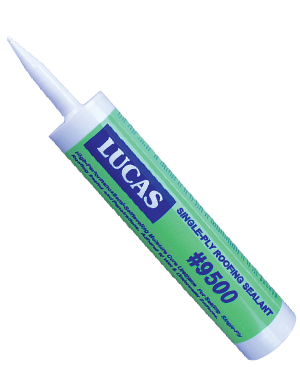 Lucas #9500 Single-Ply is a one component, non-shrink, advanced technology polyurethane sealant designed for the construction of liquid flashing systems and sealing pitch pockets and pans, metal roof seams & fasteners, inlaid gutters, polyurethane foam, PVC and EPDM roofs. It may also be used on TPO roofs when primed with Lucas #8015. #9500 is compatible with Lucas water-based acrylic coatings. It is ideal for repairing hail damaged polyurethane foam roofs. It may also be used in conjunction with custom manufactured Lucas PolyPans and metal pitch pockets which can be combined to produce pans of various sizes and shapes. Lucas #9500 is semi-self-leveling so that it can be used to seal seams and affect repairs on single-ply membranes at any slope. #9500 may also be used to fill pitch pockets and pans, seal gutters and metal roof seams & fasteners with minimal tooling. Viscous enough to avoid running and drain out issues encountered with more liquid sealers. Performance range is –40° F to +200° F.